Run - RENEWED MINDS and PURE HEARTS, TRANSFORMED by the LOVE of Mashiach (Messiah). Pursue COVENANT Relationship with YHUH (YHWH). After calling upon the Name of Yahuah (Father) and accepting Yahusha as your personal Messiah (crawling phase), after you have been immersed (baptized), after receiving counselling and after been set free from your past and broken life (walking phase), you are ready for the next step -- to be sanctified (purified), enabling you to start living a fulfilling and abundant life (running phase) . . . even though we have been delivered and set free from our past and broken lives, our minds needs to be constantly renewed and reprogrammed by the incorruptible Word of FATHER YAHUAH and our hearts purified from all contamination that perverted us since birth. 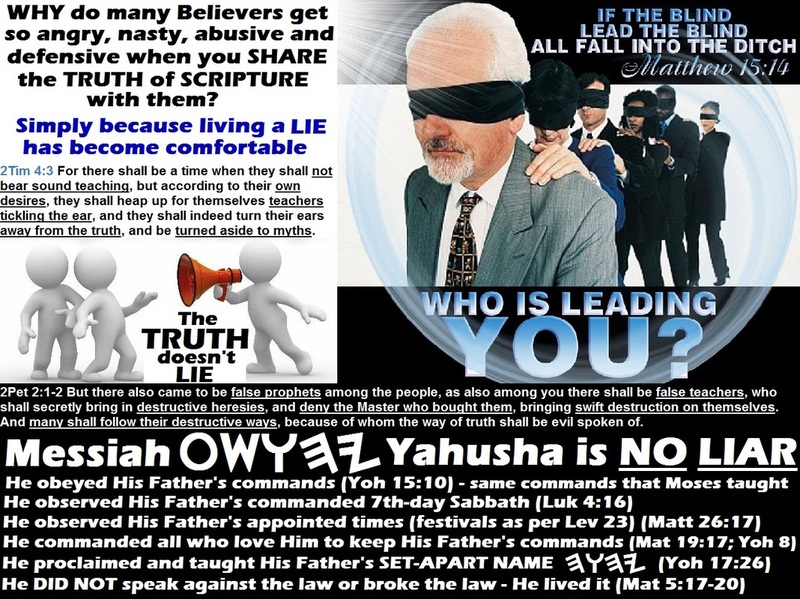 We should allow The Qodesh Ruach (Set-Apart SPIRIT) of YHUH (The Set Apart Spirit now lives in us and teaches us about FATHER's Word) to completely RENEW our MINDS and CHANGE our HEARTS to be conformed to the Word of FATHER YHUH and the likeness and image of Messiah Yahusha! Romiyim (Romans) 12:1-2 Therefore, brothers, by the mercies of Elohim (Almighty), I urge you to PRESENT your BODIES as a LIVING SACRIFICE, set apart and pleasing to Elohim; this is your spiritual worship. Do not be conformed to this age, but be TRANSFORMED by the RENEWING of your MIND, so that you may discern what is the good, pleasing, and perfect will of Elohim (Almighty). Yehezqel (Ezekiel) 36:25-27 I will also sprinkle clean water on you, and you will be clean. I will CLEANSE you from all your IMPURITIES and all your IDOLS. I will give you a NEW HEART and put a NEW SPIRIT within you; I will remove your heart of stone and give you a heart of flesh. I will place My Spirit within you and cause you to FOLLOW My statutes and carefully OBSERVE My ordinances. Pilippiyim (Philippians) 2:15 so that you may be BLAMELESS and CLEAN/PURE, children of Elohim (Almighty) who are blameless in a crooked and perverted generation, among whom you shine like stars in the world. Pilippiyim (Philippians) 1:10-11 so that you can determine what really matters and can be CLEAN/PURE and BLAMELESS in the day of Messiah, filled with the fruit of righteousness that comes through Yahusha Messiah, to the esteem and praise of Elohim. Many people are SAVED, but lack understanding of their WORTH through their IDENTITY and POSITION in YAHUSHA, rooted in a personal COVENANT RELATIONSHIP with our Creator [Abbah] FATHER YHUH/YHWH. Many believers are SAVED and have an understanding of their worth, but are COMPLACENT in pursuing their "GODLY PURPOSE". Since the garden of Eden, the enemy has broken down and destroyed people's WORTH, rooted in their IDENTITY and POSITION in Yahusha. He deceives billions of people around the world into believing that they are mistakes, "outcasts", "misfits" and ultimately failures. When he is finished stripping people of their worth through master deception, he steals their joy, peace, PURPOSE and everything else that is important to them. He destroys all their relationships and when they are down-and-out, he delivers the punch-out blow by deceiving them into believing that it is better to just end it all . 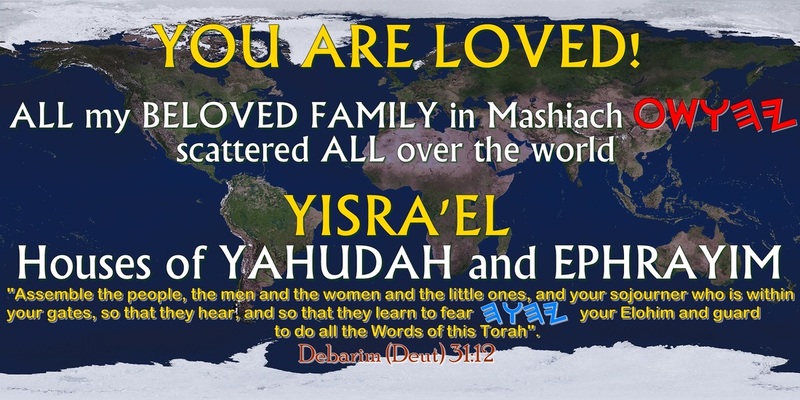 . . the Word of FATHER teaches us that our WORTH is rooted in a personal love relationship with Him through our IDENTITY and POSITION in Yahusha, by the working of the Ruach (SPIRIT) of YHUH. Let's ask the question -- what (or in what) is our WORTH as believers and followers of Yahusha? =in the CAREER that we follow? =the MOTOR VEHICLE that we drive? =the HOUSE that we live in? =whom we are MARRIED to or DATE? =what our FRIENDS say or think about us? =how much MONEY we have? Let's look at what the Word of YHUH says about our WORTH! Tehillim (Psalms) 139:14-18 I will praise You, because I have been REMARKABLY and WONDERFULLY made. Your works are wonderful, and I know this very well. My bones were NOT HIDDEN FROM YOU when I was MADE IN SECRET, when I was FORMED in the depths of the earth. Your eyes SAW ME when I was formless; all my days were written in Your book and planned before a single one of them began. Elohim (Almighty), how difficult Your thoughts are for me to comprehend; how vast their sum is! If I counted them, they would OUTNUMBER the GRAINS of SAND; when I wake up, I am still with You. Eph'siyim (Ephesians) 2:10 For we are His CREATION (Workmanship) -- created in Messiah Yahusha for good works, which Elohim prepared ahead of time so that we should walk in them. 2Qorin'tiyim (Corinthians) 5:18-20 Now everything is from Elohim, who RECONCILED us to Himself through Yahusha and gave us the ministry of reconciliation: that is, in Yahusha, Elohim was RECONCILING the WORLD to Himself, not counting their trespasses against them, and He has committed the message of reconciliation to us. Therefore, we are AMBASSADORS for Messiah; certain that Elohim (Almighty) is appealing through us, we plead on Messiah's behalf, "Be reconciled to Elohim." 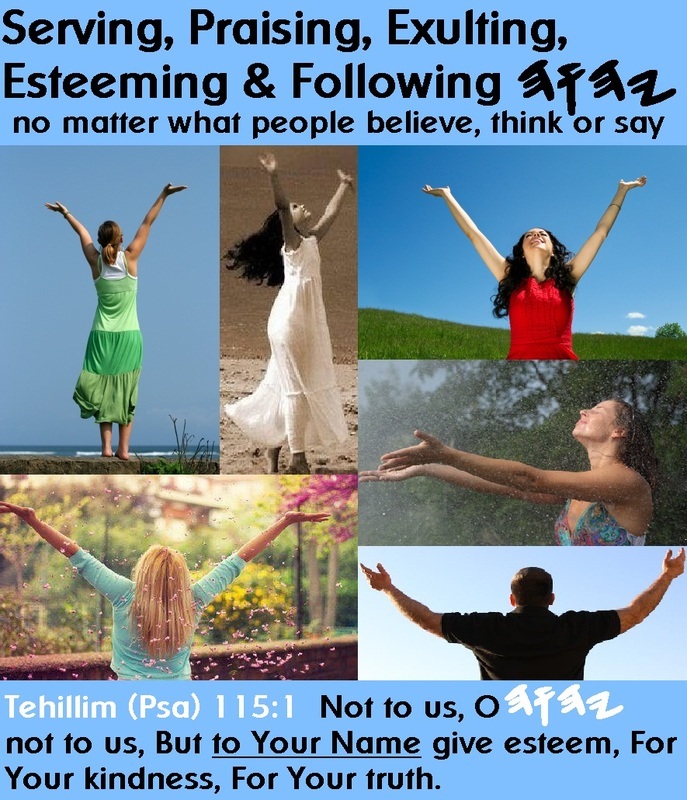 Tehillim (Psalms) 8:4-8 what is MAN that You REMEMBER him, the son of man that You look after him? You made him little less than Eloah and crowned him with glory and honor. You MADE him master OVER the WORKS of Your HANDS; You PUT EVERYTHING UNDER his FEET: all the sheep and oxen, as well as animals in the wild, birds of the sky, and fish of the sea passing through the currents of the seas. MattithYahu (Matthew) 6:19-21 "Don't collect for yourselves treasures on earth, where moth and rust destroy and where thieves break in and steal. But collect for yourselves treasures in heaven, where neither moth nor rust destroys, and where thieves don't break in and steal. For where your treasure is, there your HEART will be also". 1Kepha (Peter) 3:3 Your beauty should NOT CONSIST of OUTWARD things like elaborate hairstyles and the wearing of gold ornaments or fine clothes; instead, it should consist of the HIDDEN PERSON of the HEART with the imperishable quality of a gentle and quiet spirit, which is very VALUABLE in Elohim's eyes. Bereshith (Genesis) 1:28 Elohim (Almighty) BLESSED them, and said to them, "Be FRUITFUL, multiply, FILL the earth, and SUBDUE it. Rule the fish of the sea, the birds of the sky, and every creature that crawls on the earth." It is evident from the above scriptures that our worth are NOT defined in anyone or anything, but rather in our RELATIONSHIP with FATHER YHUH/YHWH through YAHUSHA's reconciliation work on the execution pole/tree at Calvary and through the power of The RUACH (SPIRIT) of YHUH . . . our WORTH is thus rooted in WHO we are through OUR IDENTITY and POSITION in Yahusha in our personal and intimate COVENANT RELATIONSHIP with FATHER YAHUAH and NOT in WHAT WE DO or OWN . . . what we do or own will fade away, but our COVENANT RELATIONSHIP with FATHER YaHUaH through His Son Yahusha will LAST FOREVER . . .